Let’s set the stage shall we? You’ve recently arrived at your new abode, one of the finest 1 bedroom apartments in Manhattan. You’re not terribly familiar with the area, and as you look outside and survey your surroundings, a thought hits you. “What in the world am I going to do for the 4th of July?” you wonder. An excellent question. You might have a vague idea, of course — check out a parade, go to a barbeque, see some fireworks — all the standard fare that makes the Fourth great. Specifically, though, what options are out there and which will you be adding to your list of things to do once Independence Day rolls around? Well, that’s exactly what we’re going to help you figure out today. Across the city, there are plenty of fine events for you to partake in, but there are some that stand out more than others. Let’s take a look at some of those more prominent options so you can get a better idea of what’s actually going to be worth your time. There’s nothing quite like a stunning, East Coast Independence Day celebration. You recall some of the “standard fare” we mentioned earlier? 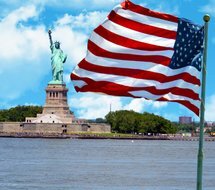 You’ll find plenty of that — the parades, the barbeques, the fireworks — but in a place as large and rich with culture as Manhattan, you’ll also find plenty of other events outside of the ordinary that you can enjoy, and we’ll be highlighting a range of options so you can tailor your 4th of July to your particular tastes with ease. This show will be running for 105 minutes and brings some rather talented performers to the stage in the likes of Gabe Shayer, Gillian Murphy, James Whiteside, and Skylar Brandt. You can get your tickets right on the ABT website, and while you’re there, might even want to check out some of the other shows they have coming up throughout the season. Baseball and the celebration of anything American go hand-in-hand, which is why you’ll likely be thrilled by a stunning showing of New York Yankees baseball on the 4th. The Yankees will be taking on the Atlanta Braves at 1:05PM, and with any luck, they’ll be able to pull out a win and make it a home game to remember. You can grab tickets here, at the Yankees website, and score some extra goodies when you snag yourself some of the premium seats. Not sure about you, but we’d head all the way to New Jersey if they said free cake was a possibility. This will be a chance to get the cake, celebrate an American great, and see some of the classic memorabilia stashed away in the museum’s impressive collection. And you can’t have infectious mambo playing without a dance floor, so the Lincoln Center will also be opening theirs for you and the crowds. Feel the rhythm and excitement, move your body, and dance the night away in superb style. It’ll be fun for the whole family. So get down there at 6:15PM and enjoy yourself until things wrap up at 11:00PM. It wouldn’t be the 4th of July without fireworks, and the biggest fireworks show in town will be the Macy’s Fireworks Show, taking place at 9:25PM. You’ll see the sky light up while the most patriotic of scores plays in the background. An excellent way to ratchet up the excitement on this, the most American of all days in the year. Who Knew 1 Bedroom Apartments in Manhattan Could Get This Exciting? If you weren’t aware, we’re more than happy to get you up to speed. Amazing places to live, such as the stunning Renoir House, have made a name for themselves for providing what might well be termed the “quintessential” New York City rental experience. Beyond that luxurious residence you’ll find yourself in, you’ll also be treated to one of the most desirable locations in all of Manhattan, along with plenty of perks to make your time on the island that much more enjoyable.